The ketogenic (keto) diet consists of eating HIGH FAT, MODERATE PROTEIN, VERY LOW CARB food. The ratio should generally be 75-80% of healthy fats, 15-20% of protein and 5-10% carbohdrates. As a guide, carbs consumption should be restricted to 10-30g a day. Want to know what 30g of carbs looks like? Check out THIS GREAT POST. How does the Ketogenic Diet compare with OTHER LOW CARB DIETS? Any very low carb diet that forces your metabolism to deal with glucose starvation on a regular basis is termed Ketogenic. Paleo focuses on whole foods and rejects any processed or cultivated foods. However, the Paleo diet can only be termed ketogenic when starches and natural sugars are omitted as these are too high in carbs for keto. Atkins, Dukan and South Breach are diets low in refined carbs and added sugar. They mimic the ketogenic diet in the early stages, but then allow carbohydrates to be re-introduced. LCHF is just an acronym of Low Carb High Fat. LFHC is its opposite, meaning Low Fat High Carb (the current Standard Western Diet). When you eat carbohydrate rich foods your body uses GLUCOSE for energy (glycolysis). Sugar, processed foods, pasta, rice, pizza, pastries, sugary cereals, etc. contain simple carbs. Whole grains, nuts, dairy, fruit and vegetables contain complex carbs. Both simple and complex carbohydrates are converted to glucose during digestion. Glucose travels to the liver, where it is either stored or released into the blood stream. Glucose is therefore an instant energy source for cellular life. Any glucose that is surplus is converted to glycogen (glycogenesis) and stored in the liver and muscles for later use. Once liver and muscles have stored sufficient glycogen, the excess is converted to fat (lipogenesis) and stored in adipose tissue. With the ketogenic diet your body learns to use FAT, instead of glucose, for energy (ketosis). When you restrict carbohydrates to a very low amount, blood glucose levels drop and your body starts to break down fat. This metabolic process releases fatty acids, which in turn create ketone bodies by ketogenesis. Ketones begin to circulate in the blood stream and become the primary energy source. As fat is burnt you lose weight. Fast. Very fast. But this is just a welcome side effect of a very healthy way of eating. Don’t we need GLUCOSE, especially for BRAIN function? It is true that the brain needs some glucose, but it is also true that it can use ketones for energy. Strictly speaking we don’t need to eat carbs in order to produce glucose. Our body is a magnificent machine that makes its own glucose as and when it needs it, via a metabolic process called gluconeogenesis. When circulating glucose is insufficient for brain health, gluconeogenesis compensates by converting protein, lipids and muscle lactate to glucose, therefore optimising blood sugar levels. If your body makes glucose from MUSCLES, does the ketogenic diet cause muscle waste? 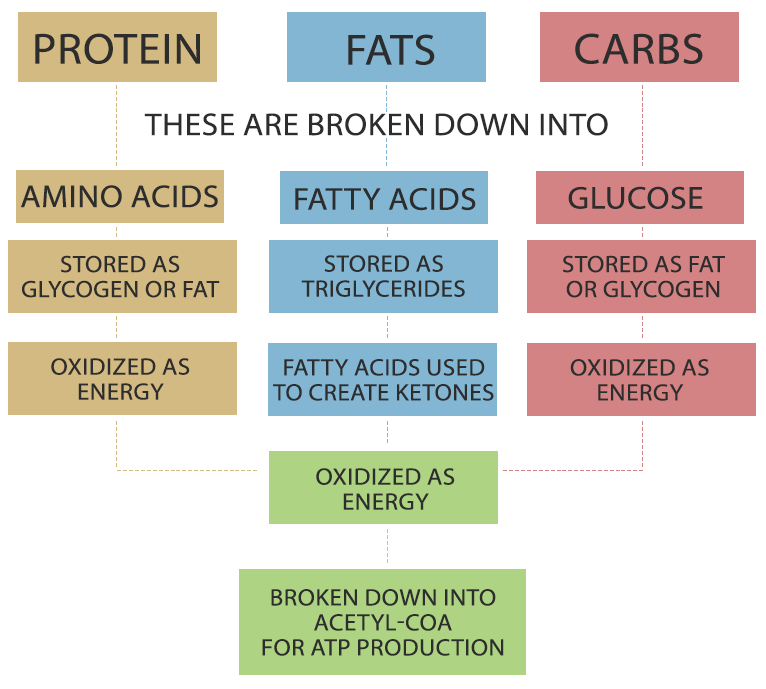 Once you’re keto adapted, your body uses ketones for energy rather than glucose. The few carbohydrates that you eat are a sufficient source of glucose for brain health, as the brain can function very efficiently on ketones. If you were to restrict carbohydrates to the point where insufficient blood glucose is circulating, gluconeogenesis would give priority to dietary protein and fat sources, sparing your muscular tissue. This, as well as the vital micronutrients obtained from eating diverse foods, is one of the reasons why I believe it’s important to ingest small quantities of carbs from natural, healthy sources, such as avocados and nuts. Doesn’t fat make you FAT? Yes and No. When you eat a high carbohydrate diet, your body uses glucose for energy, because it is a lazy source of fuel. Fats that you eat will mostly get stored for ‘starvation’ situations that in today’s age none of us will ever experience. As more and more fat is accumulated in the ‘stores’ you become overweight and then obese. When you eat mainly fat, you induce your body to enter ketosis, i.e. to burn fat for fuel. Providing you don’t hugely exceed the caloric intake required for your energy expenditure, the fat you eat is used for energy rather than stored. How can a diet so rich in fat be HEALTHY? The ‘high carb/low fat = healthy’ propaganda of the last 50 years can only be described as a disaster. Misguided information? Misinterpreted research? Bad science? Data tweaked in favour of the food and pharmaceutical industries? Vested interests? Probably all of the above and more. The one thing we all know for sure is that the ‘low fat’ era has created more disease, an obesity pandemic and more reliance on medical interventions than ever. And sadly, the ‘low fat’ campaign seems to be an unstoppable runaway train. Consumers are continuously duped into buying ready-made meals, packaged food and synthetic drinks that proudly proclaim to be ‘low fat’, ‘sugar free’ or ‘healthy’, blissfully oblivious to the fact that the laboratory products they buy couldn’t be more damaging for their health. Despite demonisation of fats, there is plenty of evidence that they are actually beneficial. Yes, fats really are GOOD FOR YOU. Hundreds of articles in medical journals have been published since the early 1900s regarding the clear benefits of eating a high fat low carb diet in a wide range of conditions. These include Diabetes, Cardiovascular Disease, Obesity, Gastroesopageal Reflux and Epilepsy, to name a few. Not all fats are equal: the Good and the Bad. Good fats are those from natural sources. Monounsaturated fats, saturated fats, polyunsaturated oils and MCTs are all great. You can find them in meat, fish, butter, cream, ghee, lard, eggs, avocado, coconut, extra virgin olive oil, nuts and seeds. Good fats can turn bad when heated to certain temperatures. Meat Fat, Ghee, Butter and Coconut Oil are best for high-heat cooking. Extra Virgin Olive Oil, Avocado Oil and Macadamia Oil are suitable for low-heat cooking. Other Vegetable/Seed/Nut Oils should not be heated at all. Bad fats are margarine, processed vegetable oils, polyunsaturated fats, trans fats and hydrogenated fats. Plenty of studies confirm that these bad fats promote cardio vascular disease, metabolic syndrome, inflammation and cancer. The correlation between saturated fat intake and cholesterol is a myth. Again, it has been known for decades that a high fat diet improves lipid profiles, especially triglycerides and there are numerous published studies that are testament to that. A high saturated fat intake is even associated with a decline in atherosclerotic progression. Quite the opposite of the currently prevailing medical advice. In case you’re eager to learn more, I am a big fan of Dr Malcolm Kendrick, a Scottish GP who isn’t afraid to call a spade a spade when it comes to heart disease, cholesterol and statins. His books The Great Cholesterol Con and Doctoring Data are highly informative, compelling and witty. You can visit his blog by clicking here. I’m happy with my WEIGHT, so why should I follow the ketogenic diet? Improved Lipid profiles (mostly triglycerides and large LDL) . There is no link whatsoever between saturated fat intake and heart disease. Reduced or removed insulin dependence in type 2 diabetes. Increased energy and physical performance. Being in ketosis is simply the state in which your metabolism functions primarily on ketones for fuel. To produce ketones you have to restrict carbohydrate intake. The level of carbs restriction required to enter ketosis much depends on the individual, as sensitivity to carbs can differ vastly from one person to another. The only way to know for sure is to measure ketones. By measuring ketones and tracking your macros (at least in the initial stages) you will find out your own personal level of carbohydrate sensitivity and learn how many carbs you’re ‘allowed’ each day in order to remain in ketosis. 2) BLOOD test. Blood testing kits are also easily available, but bear in mind that this method of testing requires pin pricking to analyse your blood, and may not be something you are keen to do. 3) BREATH test. This is my preferred method, although it requires a bit of an investment upfront as the tool isn’t cheap. On the plus side, it is easier and more convenient than the other test methods and you won’t need to keep restocking supplies. I use the Ketonix breath analyser (U.S. option HERE). What are MACROS and why are they important? Macros (macronutrients) are the collective term for carbs, protein and fats. You’ll find them on the outer packaging of most foods. Once you become familiar with what to eat and how many carbs are in the food you eat, you won’t need to worry about constantly counting carbs, fats and protein. However, you won’t get to that point unless you’ve assessed your macros and determined your energy expenditure. There are various online calculators that predict your energy requirement (Kcals) and the ratio of carbs-fat-protein you should be aiming for. Try this great KETO MACROS CALCULATOR. At least initially, you do need to keep track of the macros in food that you eat. If you don’t, you will just be guessing what your carbs intake is, plus you won’t know if the amount of carbs you’re eating is right for you. I recommend you use one of the many apps available. Most of them are free or inexpensive. To calculate macros for my recipes, I use FatSecret. Do I need to count CALORIES and follow MEAL PLANS? No, you don’t have to. But it may be wise. Especially at the beginning when you are trying to flip the table on high-carb low-fat. Most people lose weight on keto without counting calories, because keto makes them feel satiated more quickly and for longer periods of time, which leads to skipping meals and eating smaller portions. However, everyone’s different both in terms of metabolism and activity. Do whatever you feel comfortable with. Increase magnesium and potassium by eating avocados, green leafy vegetables, fish, nuts and dark chocolate. Increase sodium intake by eating salty cured meats, bacon and adding bouillon (stock cubes) and salt to food. Drink plenty of water to replenish your electrolytes. Get plenty of rest. Sleep is always the best way for the body to recover. How can I follow the ketogenic lifestyle if I love SWEET FOODS, PASTA, PIZZA and RICE? There is a huge online ketogenic community that offers plenty of resources to help you become keto adapted. A good selection of ketogenic recipe books is available on Amazon. Many bloggers like myself have made it their mission to publish ketogenic recipes in order to help everyone in their journey to a better dietary lifestyle. Rice, pasta, pizza and sweet treats can ALL become low carb, high fat, grain free, gluten free or sugar free (or at least similar in taste and consistency) by using alternative ingredients. For example, cauliflower ‘rice’ can replace normal rice, eggs and courgettes can make a delicious pizza crust (check out my pizza base options here and here), there are low carb pasta options like black bean pasta (U.S. option HERE), zoodles (thin courgette strings) can replace noodles, you can make a delicious mash ‘potato’ with cauliflower. There are infinite possibilities and there is an enormous amount of help available. In any case, once your body becomes a keto, fat burning, mean machine, you’ll find that your food cravings minimise if not disappear altogether. Is the keto diet EXPENSIVE? The ketogenic diet doesn’t have to be expensive. You definitely can do keto on a budget. In fact, my most delicious meat recipes use the cheapest cuts, like pork or beef cheeks. People who say that keto is expensive are referring to the cost of specialist, organic ingredients, mainly used in baking. I certainly use a lot of these in my recipes, but that’s mostly a personal choice. Many keto-friendly ingredients are readily available locally and at budget prices. However, you will probably find that, as you reap the benefits of keto and your overall health improves, you will start to question inferior ingredients and begin to lean more and more towards organic, better quality foods and meat from pasture raised animals, all of which cost more. Can anyone follow the ketogenic diet SAFELY? The vast majority of people can. However, certain metabolic dysfunctions and medical conditions preclude the ketogenic diet. Click here for a list kindly provided by ketogenic-diet-resource.com. If you’re in doubt, you should check with your trusted medical advisor.